Went out last night for a drink with a friend of mine and we ended up in a conversation with a professor from the University of Western Ontario who teaches in the Women's Studies Dept and specializes in Medical Sociology or the sociology of medicine, I'm not sure which. Anyway, the conversation turned to the "obesity epidemic" that is much in the news and about which there was a recent study. Two things that came out of that conversation were interesting to me. The BMI was formulated, by a mathematician, not a medical physician, to provide a simple, easy-to-apply mathematical formula to give a broad, society-level measure of weight issues. It has absolutely no scientific or medical basis. It is based purely on a crude statistical analysis. It measures a general society trend, it does not predict. Since the majority of people today (and in Quetelet's time) lead fairly sedentary lives, and are not particularly active, the formula tacitly assumes low muscle mass and high relative fat content. It applies moderately well when applied to such people because it was formulated by focusing on them! Duh! The absurdity of the BMI's arbitrariness, assumptions about activity levels and the idea of what constitutes a "good weight" are proven by the fact that the above blog author, a slender physically active man, is classified as overweight. The problem, as he notes, is that bone and muscle weigh more than fat and so, chances are, athletes and weight lifters will have higher BMI numbers (BMI is calculated by dividing a person's weight in kilograms by their height in metres). The professor was also concerned about our society's obsession with thinness and youth as a measure of attractiveness. And I agree here also. To see rail thing models on the runway or barely pubescent girls without hips advertising bikinis - and these days to see young men with not an ounce of body fat on their bodies (and probably a little dehydrated to make muscles look more defined) - is more than a little disturbing. But, at the same time, I think it's one-sided to just look at the lies/inaccuracies of BMI and of the "ideal" body type. BMI may be heavily flawed but its rise over the past two decades nonetheless does demonstrate that average weights in relation to heights are rising. Since there hasn't been a concomitant increase in physical activity - though there has been a substantial growth in gym memberships - it's not unreasonable to assume that the increase has not been in bone density and muscle mass. In fact, a recent report on the rise in obesity in the USA did factor in physical activity as a component part of measuring overweight and obesity. a study of 33,000 American adults, published recently in the American Journal of Public Health (Vol 96, No.1, January 2006, 173-178), showed that male life expectancy is greatest for BMIs of about 26 - overweight under the CDC's rule, and equivalent to 24 lb extra for the typical man. For women, the study found an optimum BMI of about 23.5, about 7 lbs heavier than the CDC's standard. But, again, it is certainly the case that weights are rising and physical activity isn't, suggesting a trend that is apparent if one just looks around them - people, particularly over 30, are not lean, mean machines. Once we get out of the youth phase of our lives, most of us start to pack on weight so that by the time we're in our forties we have guts and butts. What is shocking in the recently released study is just how much weights have risen in the past 20 years. Again, the study I linked to above at the Trust for America's Health gives some shocking numbers. ...Since 1995, diabetes rates have doubled in eight states. Then, only four states had diabetes rates above 6 percent. Now, 43 states have diabetes rates over 7 percent, and 32 have rates above 8 percent. Twenty years ago, 37 states had hypertension rates over 20 percent. Now, every state is over 20 percent, with nine over 30 percent. Adult obesity rates for Blacks topped 40 percent in 15 states, 35 percent in 35 states, and 30 percent in 42 states and D.C.
Rates of adult obesity among Latinos were above 35 percent in four states (Mississippi, North Dakota, South Carolina, and Texas) and at least 30 percent in 23 states. 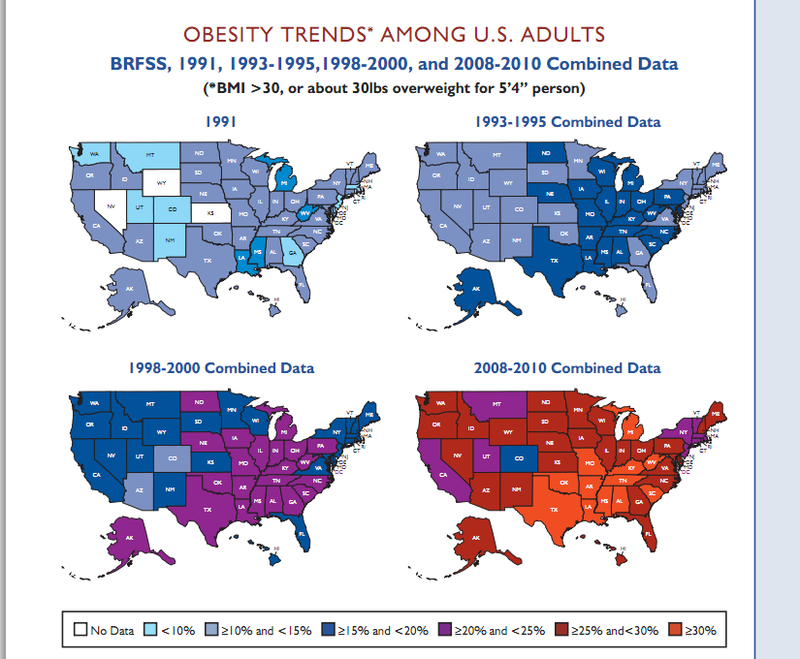 Meanwhile, rates of adult obesity for Whites topped 30 percent in just four states (Kentucky, Mississippi, Tennessee, and West Virginia) and no state had a rate higher than 32.1 percent. Nearly 33 percent of adults who did not graduate high school are obese, compared with 21.5 percent of those who graduated from college or technical college. More than 33 percent of adults who earn less than $15,000 per year were obese, compared with 24.6 percent of those who earn at least $50,000 per year. To my mind, the actual obesity rates are of less interest than the overall trend towards poorer health and its association with class oppression, and its intersection with race and ethnicity (basically, a higher proportion of black and Latino Americans are poor and working class). This is connected with the fact that more and more food is of low nutritional quality and low energy quality, being carb heavy and protein and good fat depleted. Of course, like the cheap clothes we buy from H & M that resemble the quality fashion apparel purchased by the wealthy, our crap food is disguised as tasty gourmet treats. And it is shovelled onto our plates in abundance, making us feel like we live in the land of milk and honey when in fact, we are a culture and an economy in a slow decline - at least as far as working class living standards are concerned. And that is the ironic flip side of the anorexic model and the zero percentage fat man model with the surreal abs. The more we poison ourselves with fat and diabetes inducing food - increasingly the only food we can afford - the more we long to be thin. They are two sides of the same coin, and another expression of our envy of the wealthy. Shows from the 80s & 90s like "Lifestyle of the Rich & Famous" and reality shows like "The O.C. ", which aired till 2007 perform a similar function. Most of us can never be rich, thin, "beautiful" so instead we worship an idealized and distorted image of those things. In the case of thinness, it is twisted to the point of anorexia. Great piece pulling apart a favorite topic.